Poke places are the all the rage now in the restaurant scene, with openings in Seattle, the eastside, Snohomish county and more. So, maybe it’s not a stretch that we may get as many poke places as we have Subway sandwich shops. Have you seen the list of new restaurant openings in the last three months? It reads like a roll call of poke joints. The California-based chain Pokeworks is opening its sixth location in Bellevue near Lincoln Square next month. This comes after that national chain opened its first branch in our state in downtown Seattle. Also in Bellevue, local boys Norman Wu and Danny Brawer are two weeks away from opening Just Poke across from Purple Cafe & Wine Bar. This comes after they just opened another Just Poke in Kirkland. Wu and his business partner started a commercial consulting firm in Los Angeles, and after seeing how trendy poke is in So Cal, they decided to open a couple here, only to find the poke party had already started. Poke’s popularity comes partly from low overhead; these establishments don’t incur the big expenses of big restaurants. They don’t need a chef, nor much of a kitchen. It’s raw fish served with rice and sides, such as seaweed and greens. Apparently, they also don’t need much space. Most are take-out joints or holes-in-the-wall with fewer than 20 seats. In Seattle, No Vacancy Poke opens inside Hotel Albatross in Ballard this week. On March 31, Newport Poke will open across from Seattle University. 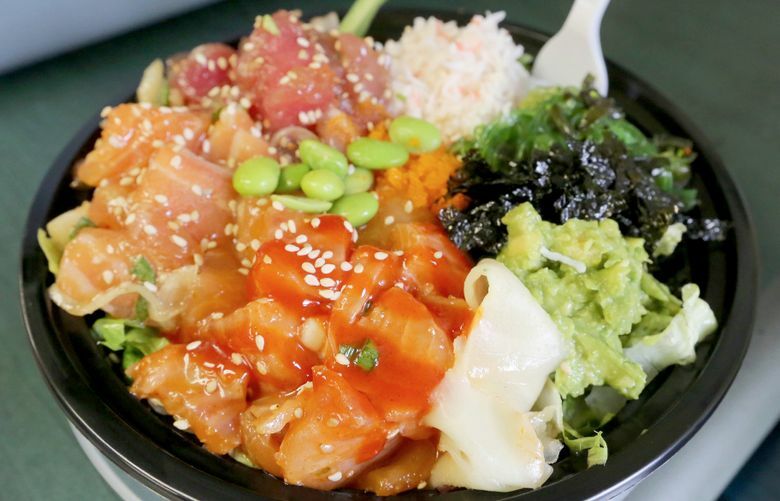 Around that time, Hawaiian Poke & Sushi Bar will also likely open on Broadway East (not to be confused with the Wanderfish Poke on Broadway across from the Sunday farmer’s market). In Belltown, FOB Poke Bar opened last month. In the Chinatown-International District, GoPoke has created a lot of waves with its poke burrito or “Pokerrito” while in downtown Poke Alice has a following with the lunch crowd. On the Eastside, Poke Mix opened in Bellevue Square. (It got some competition on the way. See Just Poke and Pokeworks above.) In Edmonds, one of the most talked about openings in Snohomish County this year is Ono Poke from Hawaiian Steven Ono. You’ll know his fish is fresh because Ono put in a butchering-station so you can see him fillet a 100-pound tuna fish. In Shoreline, Star Poke opened up on Aurora Avenue North last month while Sam Choy’s Poke to the Max in Hillman City is expanding south to Tacoma.